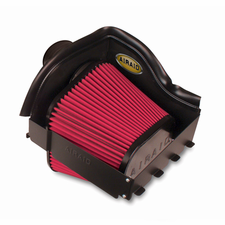 * Red Filter These QuickFit air intake systems provide a nice increase in both horsepower and torque. They utilize the factory air intake box, taking advantage of the dense, cool airflow that the factory location provides. At the heart of these systems is Airaid's Premium SynthaFlow series high-flow filter, which increases airflow significantly over the stock assembly. For an easy fit and great airflow, you can trust Airaid. No one else gives you the bold clean styling of our Aftermarket Dress Ups, Suspension and Performance Parts for your American Muscle Car like UPR Products! Click Here for Instructions Click Here for Dyno Results Fits these Vehicles: 2011 2012 2013 2014 Ford 5.0L 3.7L 3.5L Ecoboost Turbo V6 V8 Mustang Roush & Saleen Vehicles. 2010 2011 2012 2013 2014 Ford SVT Raptor 6.2L 2011 2012 2013 2014 2014 Ford Superduty F250 F350 6.2L Made in the USA! These QuickFit air intake systems provide a nice increase in both horsepower and torque. They utilize the factory air intake box, taking advantage of the dense, cool airflow that the factory location provides. At the heart of these systems is Airaid's Premium SynthaFlow series high-flow filter, which increases airflow significantly over the stock assembly. For an easy fit and great airflow, you can trust Airaid. 2011 2012 2013 2014 Ford 5.0L 3.7L 3.5L Ecoboost Turbo V6 V8 Mustang Roush & Saleen Vehicles.